When you first adopt a dog, there’s no doubt you have big plans to train it, feed it well, and make sure it gets plenty of exercise and activity. However, when you’re busy raising a family, finding the time to exercise your dog can seem a bit difficult, if not impossible. Exercise is absolutely essential, not just for your dog’s physical health but also their mental well-being, so it’s not something they can do without. So, what can you do as a responsible dog owner to ensure that your dog is getting enough exercise and activity, even when you’re pressed for time? Here are some tips you can use. Because you aren’t always going to be around to exercise your dog and play with them, it’s important to provide them with a variety of toys that keep them active. The toys should be something they can play with on their own or something you can play along with. Some of the most popular toys include braided ropes, which are perfect for gnawing on, playing fetch, and tug-of-war; toss toys that the dog can chase after; Frisbees/discs; and balls. 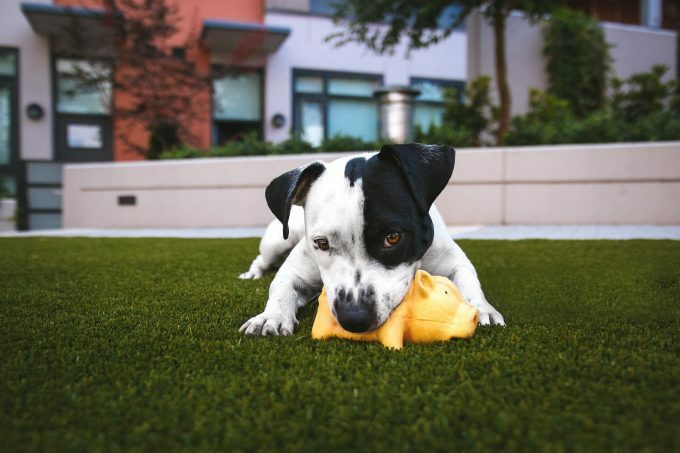 If you’re looking for a place to find safe and fun toys for your dog, check out Our Pet Spot, which offers a large selection of toys you can purchase online saving you the hassle of having to head out to a store in person. Another tip is to bundle your exercise with your dogs’. Find an activity that you can do together so you are both getting in your daily dose of activity. This could be walking, hiking, jogging, swimming, running, and even bike riding (they can run alongside you). Combining your activities gives you a chance to bond, and work on your physical well-being together. As far as how much exercise they need, 30 minutes of any of the above-mentioned activities is perfect. There’s another aspect to exercise when it comes to dogs and that’s mental exercise. Puzzle toys are perfect in helping your dog to get that brain workout, and usually, they force the dog to get up and move around at the same time. If you want to take a more active role in their mental exercises, then you could always give clicker training a try. The final tip is to get the kids involved in exercising the dog. Sure, they may not be old enough to walk the dog, but there’s no reason they can’t be outdoors running around in the yard with the family pet, playing fetch, or any other activity. There are so many different reasons that exercising your dog is important, including its mental and physical well-being. There is also the fact that a well-exercised dog makes for a well-behaved and very happy member of the family.